William Shakespeare was indisputably among the top English-language poets and playwrights of all time. He was born in the village of Stratford-upon-Avon in April 1564 and died there in April 1616. His surviving body of work includes 38 plays, 154 sonnets and two narrative poems, the majority of which he penned between 1589 and 1613. While much of Shakespeare's biography is unknown, murky or subject to dispute, historians have managed to verify factual data through his own writings, the works of his contemporaries and historical documents. The Bard of Avon, as William Shakespeare is also known, was the child of a leather merchant and glover, John Shakespeare. His mother was from a family of landed gentry. In the absence of records detailing Shakespeare's early education, historians guess he attended a nearby school where he learned to read and write English as well as Latin. In 1582, when he was just 18, Shakespeare married Anne Hathaway, a woman eight years his senior. They would have three children, a daughter in 1583 and a set of twins in 1585. They lost their only son, Hamnet, when the boy was 11 years old. Daughters Susanna and Judith would live to be 66 and 77, respectively. From 1586 until 1592, very little information is available regarding the Shakespeare household or the bard himself. During this period that historians refer to as the writer's lost years, only a scant legal document or two gives evidence of Shakespeare's existence. Over the years, various biographers have speculated that he may have been a poacher on the run from a disgruntled landowner, a horse-minder at a London theater, or more probably, a local schoolmaster. Also during his lost years, the bard was devoting a good portion of his time to playwriting. By 1592, solid evidence shows that one if not more of his plays was underway on London stages. The first of his plays in production was probably "Henry IV, Part One," an historical work which not only chronicles the active years of the monarch's reign but also introduces his son Hal and Henry Percy, or Hotspur, a rival. The bard had established himself in London prior to 1592, as evidenced by a mention in the London Times by a fellow playwright. He completed "Henry IV, Part Two" and "Henry V" early in the 1590s. By 1594, he and a group of colleagues had formed an acting troupe they called The Lord Chamberlain's Men, in honor of their patron, which would soon grow to prominence in the London theater scene. The 1590s were quite a prolific time for Shakespeare. He wrote additional historic plays, including "Richard II," "Richard III," and "Titus Andronicus." He also penned the comedies "Two Gentlemen of Verona," "The Taming of the Shrew" and "A Comedy of Errors," probably early in the decade. By 1597, Shakespeare had written approximately 15 of his 38 surviving plays. He had achieved enough financial success to purchase one of Stratford's nicest homes for his family. He continued to live principally in London where he wrote and acted in his plays. During periods such as Lent when theaters were closed and when outbreaks of the plague shut down the city, he likely spent time with his family in Stratford..
Shakespeare was not only writing scripts for his company, often based on stories from mythology, literature and historic accounts, but he was also acting in his own plays. The Lord Chamberlain's Men put on performances at such London venues as The Theatre and The Curtain. In 1599, the acting troupe built The Globe from the ruins of The Theater, establishing their own playhouse, which opened in 1599. 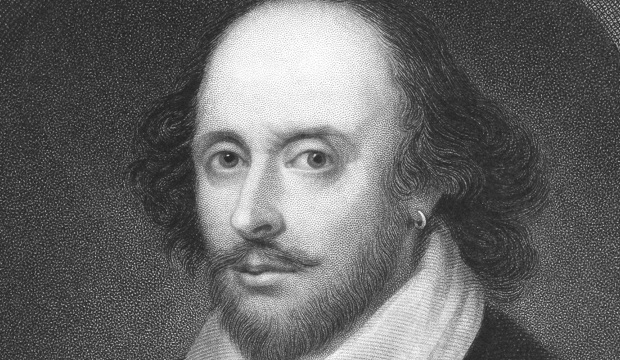 Early in the new century, the bard continued to produce great literature, penning such masterworks as "Troilus and Cressida," "Measure for Measure," "All's Well That Ends Well," and some of his most renowned tragedies, including "Hamlet," "Othello" and "King Lear." In 1603, The Lord Chamberlain's Men delivered a command performance of "A Midsummer Night's Dream" at Queen Elizabeth's Hampton court. When the Queen died later that year, the acting troupe changed its name to The King's Men in honor of the newly crowned King James I. Their first performance for the monarch was "As You Like It." The bard was growing artistically during this era, customizing his mastery of blank verse with wit and intention to enrich his characters' dialogue and enliven the action. He employed such techniques as run-on lines and inflected phrasing to breathe life into a poetic form that tended to the monotone if used within strict parameters of ten syllables per line and alternating stressed and unstressed syllables. The dialogue of his play "Hamlet," for example, seems animated in comparison to the more strictly patterned lines of earlier works such as "Henry V." Shakespeare also provided moments of variation in his plays by inserting bits of rhymed verse in the dialogue, for example in Puck's epilogue in "A Midsummer Night's Dream." During the first decade of the 17th century, Shakespeare published his "Sonnets," a collection of 154 14-line works that employed the same blank verse format as his plays but with the specific rhyme scheme of three quatrains and a concluding couplet. Released as a printed collection in 1609, Shakespeare's sonnets had likely been written individually over time, and those within his circle of friends were probably already familiar with some of them. The form the bard employed for his verses became known as the Shakespearean sonnet, as opposed to the traditional Petrarchan sonnet, which consists of an octet and a sestet. In his last plays, "Cymbeline," "A Winter's Tale," and "The Tempest," the bard test-drove a hybrid genre, the tragicomedy, also known as the romance. While they take a more somber, serious tone than such comedies as "Twelfth Night," these tragicomedies end on a positive note, unlike such tragedies as "King Lear." The bard also completed two last works for theater, "Henry VIII" and "The Two Noble Kinsmen," with a collaborator, likely John Fletcher, a contemporary playwright. Just after the completion of "Henry VIII" in 1613, The King's Men lost the Globe playhouse to a fire. By the time they reopened in 1614, Shakespeare had already retired to his family home in Stratford where he died in 1616 at the age of 52. While no verified version of the manner of his death exists today, one account, written by the vicar of Stratford 50 years later, attributes his untimely demise to drinking too hard with his friends John Drayton and Ben Johnson, and catching a fatal fever as a result. Due in part to the great gaps in knowledge regarding Shakespeare's early education and the lost years, the bard has always been shrouded in mystery. In addition, not a single manuscript he wrote in his own hand survived the centuries. One scholarly explanation for this lack of historical verification is that "William Shakespeare" was the pen name of some more illustrious, well-educated figure of the Elizabethan era. The controversy did not see the light of day until more than two centuries after the bard's death. Among the first to question the authorship of such all-time great works as "Macbeth" was a Pennsylvanian Lutheran named Samuel Schmucker, and he was merely drawing an analogy. He likened the scholarly trend of his time in using historic data to raise doubts about the existence of Christ was akin to speculating that Shakespeare never existed. An offhand remark, but that is all it took to sow the seed of controversy. 1. The lack of documentation for Shakespeare's existence. 2. The disputed authorship of particular works. 3. The unlikelihood that someone with the bard's background would rise to greatness. Among the most famous doubters were Mark Twain, Henry James, Sigmund Freud and Orson Wells. Among the candidates people have mentioned as the "real" William Shakespeare are Sir Francis Bacon, Christopher Marlowe, and Earl of Oxford Edward DeVere. The controversy has even found its way into the U.S. Supreme Court as the subject of a moot debate. One of the bard's most enduring influences is on the English language. Not only are many quotes from his plays, such as Polonius' advice to Hamlet, "Neither a borrower nor a lender be," a part of the English lexicon, but the way in which Shakespeare shaped the language to suit his own artistic purposes would influence future writers and poets throughout subsequent history, from Charles Dickens to Maya Angelou. Charles Dickens drew upon the bard's writings for many of his titles as well as numerous quotations he used within his novels. Shakespeare also enriched the language with the addition of approximately 2,000 new words and numerous new usages of existing vocabulary. Some of the words attributed to the bard include "auspicious," "dwindle" and "sanctimonious." Phrases he originated that are still in the popular lexicon include, "break the ice" from "The Taming of the Shrew" and "in a pickle" from "The Tempest." The bard's masterful characterizations have become archetypes for social standards. Such larger-than-life characters as Hamlet, King Lear, Othello, Romeo and Juliet, Ophelia and a host of others inform contemporary social standards in ways that are inextricably woven into the fabric of modern society. They not only appear as standard icons in the theater, movies, literature and visual arts, but also have established themselves as cultural norms, particularly in English-speaking societies. It is not even necessary to have read the works of Shakespeare to be familiar with his well-known quotations and characters. Even the controversy surrounding the authorship of Shakespeare's plays and sonnets serves to keep the bard very much a vital figure in contemporary lore. The probability that the mystery will probably never be resolved, given the lack of hard evidence, means that Shakespearean scholars, school teachers and their students will be reading and discussing the 16th-century master far into the future.